No one warned me about September being a full moon month, all month long! That being said, it is almost October, a month that brings more of the lovely fall colors and a month during which I shall age one more year. October will be a month of many new yarns, with some lovely surprises to follow. With that, here is a peak. I have been waiting to introduce more of Jojoland. Some of you may remember, we started with Jojoland’s sock yarn Melody and I was waiting for her new colors to come in (they are on their way over as I type). I got inpatient and knitted with one of her new lines. Hence, the decision to post it here and at the store. The first line is Jojoland’s Harmony, a cobweb weight lace yarn with soft variegation – long stripes and subtle changes. Harmony comes in 50 gram balls that have 880 yards each! One skein of Harmony is enough for a stole and I believe two would make a big shawl. I found a photo of a stole knitted with Harmony by Jojo herself. I have seen this shawl in person and it is very light and lovely. The second new yarn from Jojoland is Rhythm, a light worsted weight yarn that is 100% wool and also stripes softly and in long stripes. I have not felted with this yarn but Jojo assures us that it is feltable. I did however knit with Rhythm as I found a color that was just perfect for my son’s Swirly Burly Wizard Hat (color line Sandy Beaches & Blue Skies). 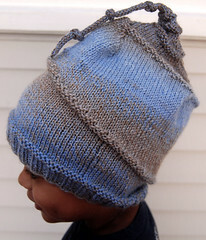 The hat is designed by my son and knitted by me as per his instructions – “no mama, I want it longer and more swirlies please!” One skein would have been enough for a traditional hat that would fit a 4-5 year old but given my son’s instructions for a big, floppy hat I used 1.5+ skeins. 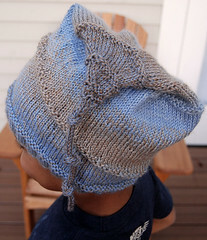 The Swirly hat stands if demanded but would rather fold, especially when its raining (it never rains in Seattle). Just one final note, my son absolutely refuses to wear itchy hats and has had no problem wearing his new hat. I found Rhythm soft and a fun yarn to knit.